Our phone line at our house in Adelaide is getting the phone line connected on Monday, and ADSL connected the day after, assuming all goes well. I won't have to live for the half an hour or so a day I can use the internet at WiFi hotspots. It's going to be tough getting used to slow, "capped" internet plans that cost a fortune again though, unlimited downloads in Singapore have really spoilt me. And because I dislike dry posts that don't contain any images, for your convenience I have enclosed a photograph of an off-road wheel chair. I'm hoping IKEA starts stocking the office chair version of these soon, the canister wheels on my old office chair in my room were totaled when I drag-raced that Porsche 959 Turbo down Mt Lofty. For what it's worth, I did manage to come second despite not actually staying on the road for very long. The lack of a steering wheel on my chair gave the 959 an unfair advantage I think, I just used a broom handle with a rubber stopper on the end of it. The Tank Chair, the solution to all the world's problems, and then some. 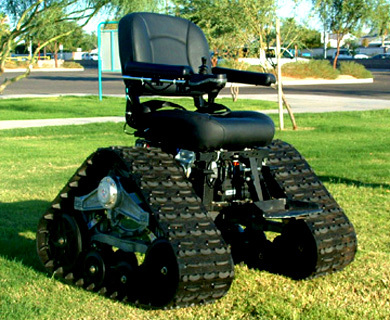 For a wheelchair that can go anywhere, look no further than the Tank Chair. This custom off-road chair “conquers streams, mud, snow, sand, gravel — allowing you to get back to nature — and can also climb up and down stairs”. It features motors built by NPC Robotics.